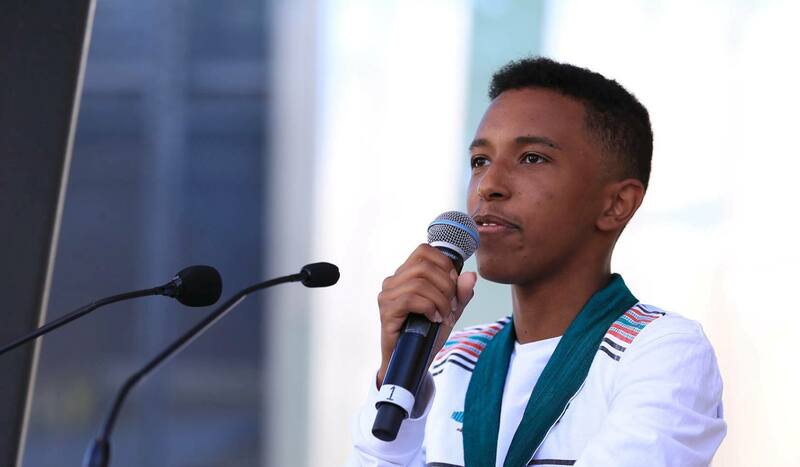 Hello everyone, my name is Bonsen and I want to welcome you to 2019’s Oromo Festival. Before we begin, I want to acknowledge the traditional and true custodians of this land and pay my respects to their elders past and present, and remind all of us here that sovereignty was never ceded. I also want to pay my respects to our dead, and remember their legacies, sacrifices and lives. This speech is many things, it is a call for solidarity and unity. We are different in so many ways, and to me, being Oromo is about acknowledging our differences and understanding that we are strong because of our differences, because our respective experiences and beliefs provide perspectives to our journey towards freedom that we wouldn’t get anywhere else. Difference has been used against so many people, but our differences should not be the death of us. Our differences give us strength and wisdom, and we should, and must address these differences with kindness and respect because that is the only way our goal of freedom can be actualised. To quote the great Audre Lorde, “We share a common interest, survival, and it cannot be pursued in isolation from others simply because their differences make us uncomfortable”, and this is the energy I’m claiming for us 2019 and beyond. This speech is about community. We are a very communal people, as far as I know, we’ve organised our societies by centring community and have done an amazing job of doing so in a country that favours and encourages individualism. For diasporic youth who face so much pressure to assimilate and adapt, we have done an amazing job of being unapologetically Oromo and unwavering in our Oromo identity, and seek solace in our people and our community, and that’s one of the most beautiful things about us as a people. 2018 was a big year for us. We took a step closer to actualising our dream of freedom, so many people went back home and got to experience their country to the fullest extent and we saw that perseverance comes through. But that doesn’t mean our fight is over, if anything, it means we have to keep fighting, keep organising with Oromo folks, reach out to those who can and want to help, Oromo or not, and correct those misinformed about our purpose, we all have a role to play, whether it be a role in raising awareness, or educating, or learning and claiming your cultural roots. These are all important roles in achieving self-determination and fighting forces that kill our people and steal our land. Freedom cannot be given to us, nor can governments and political leaders give us the right to self-determination. We must take these ourselves, and we can only do so when we recognise our strengths, both as individuals and as a community, and fight relentlessly and unwaveringly for our country. Thank you for listening, and I hope y’all have a good time.